We're an award-winning agency with more than 50 years of service improving the quality of life in our community. The San Elijo Water Reclamation Facility (SEWRF) is a publicly owned wastewater treatment and water recycling facility responsible for collecting, treating and safely disposing of, or recycling wastewater and its residuals for residents and businesses in the Solana Beach, Rancho Santa Fe, Olivenhain and Cardiff communities. The plant is located in the Cardiff area, within the City of Encinitas, off Manchester Avenue. 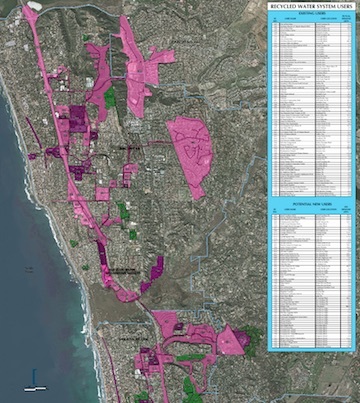 Approximately 19 square miles including the City of Solana Beach, portions of the City of Encinitas and Rancho Santa Fe. The San Elijo Joint Powers Authority (SEJPA) owns and operates the SEWRF, 20 miles of recycled water distribution pipelines, two recycled water reservoirs, and operates and maintains nine wastewater lift stations. The SEWRF handles mostly domestic waste and is permitted to discharge up to 2.48 million gallons per day (MGD) of tertiary treated wastewater to recycled water users and up to 5.25 MGD of secondary treated wastewater to the Pacific Ocean through the San Elijo Ocean Outfall, 1.5 miles offshore. A highly specialized laboratory monitors the effectiveness of our treatment process and evaluates wastewater samples for compliance. Analytical services available include chemical, biological, and microbiological testing. The chemists employ a combination of physical and chemical techniques to provide assessments of the inorganic and organic chemicals, bacteria and toxicity in the incoming wastewater, outgoing effluent and reclaimed water. SEJPA staff can provide educational materials, tours or lectures for your class or event. Call 760.753.6203 for details. The SEJPA owns and operates the San Elijo Water Reclamation Facility, which consists of wastewater treatment and water reclamation. Wastewater facilities include the 5.25 MGD treatment plant located in Cardff by the Sea, eight wastewater lift stations, and the 25.5 MGD San Elijo Ocean Outfall. Recycled water facilities include 2.5 MGD of sand filtration, 1.4 MGD of micro filtration, and 0.5 MGD of reverse osmosis, as well as 20 miles of recycled water distribution pipelines, and three recycled water reservoirs. The San Elijo Ocean Outfall is co-owned with the City of Escondido. The ocean Outfall is comprised of 30-inch and 48-inch diameter reinforced concrete pipe that extends 1.5 miles into the ocean. Approximately 1,400 to 1,600 acre-feet is produced annually for local use by parks, schools, churches, golf courses, freeway and street landscaping, businesses, and homeowners associations for landscape irrigation, and industrial cooling tower use. Three recycled water reservoirs, one underground, and two above, with storage capacity ranging from 750,000 to 1,000,000 gallons, provide operational storage for the recycled water program. Historically, wastewater generated in Solana Beach and Cardiff was collected in private septic tanks or privately discharged into the surf. In 1950, Solana Beach and Cardiff collection systems were constructed, but due to the mounting water quality concerns in the San Elijo Lagoon, the San Elijo Water Pollution Control Facility (now the San Elijo Water Reclamation Facility, SEWRF) was constructed in 1965. The original San Elijo Water Pollution Control Facility was placed in service in 1966 with a capacity of 2 million gallons per day (MGD) and was operated by the County of San Diego. As flows increased and the Clean Water Act loomed, the plant converted to advanced primary treatment in 1981, increasing capacity to 2.87 MGD. In 1986, the Cities of Solana Beach and Encinitas were incorporated and ownership of the facility was transferred from the County to the San Elijo Joint Powers Authority. Major facility improvements were completed in 1992, which included secondary treatment facilities and other upgrades that increased the treatment capacity to 5.25 MGD. In 2000, the agency completed the construction of its recycled water utility. This system creates locally produced drought resistent, water for irrigation and industrial uses in the Cities of Encinitas, Solana Beach, and Del Mar. The recycled water utility includes treatment (both traditional sand filtration and micro filtration/reverse osmosis), disinfection, distribution, and storage. The treatment capacity is 3.02 MGD and the distribution system includes approximately 20 miles of piping and 3 storage reservoirs. 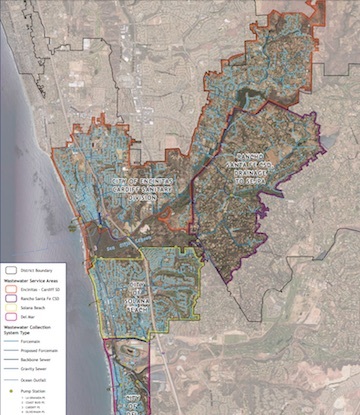 The agency sells the recycled water to San Dieguito Water District, Santa Fe Irrigation District, Olivenhain Municipal Water District, and the City of Del Mar for resale to their customers. The San Elijo Joint Powers Authority (SEJPA) governs the operations of the SEWRF. It is similar to public utilities that supply drinking water, natural gas or electricity. Operation and maintenance revenues come from member agencies sanitation funds, outside services and the sale of recycled water. 2006 Honorable Mention for Civil Engineer in Public Sector - Michael Thornton, P.E.